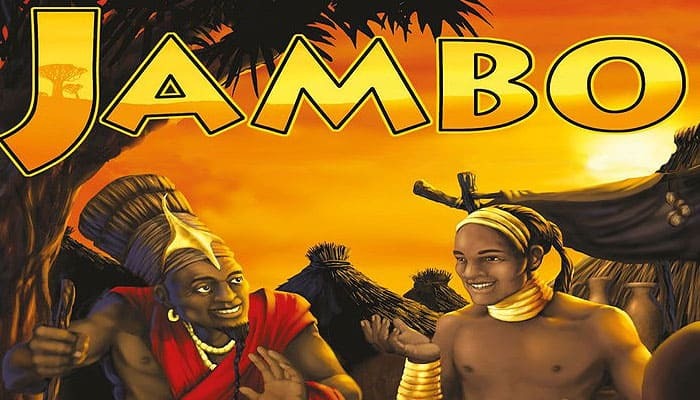 "Jambo" means "Hello" in Swahili. With this greeting, happy merchants welcomed their customers in Central Africa before colonization. The players are traders in those days, competing to be the first to earn 60 gold by selling tea, hide, fruits, salt, silk, and trinkets. The game is played with cards, which represent goods, people (which can help you or hinder your opponent), and animals (which add a bit of spice to the game). Players take turns with up to 5 actions per turn until one player reaches the goal and wins the game. The winner is the player with the most gold at the end of the game. Before the first, game, carefully remove the wares, gold, and action .markers from their frames. The players sit opposite each other at the table. Each player takes 1 large market stand (green or red) and places it in his play area (the area before him on the table). Each can place up to six wares on his large market stand. Shuffle the remaining cards and place them face-down on the table between the players as the card supply. Each player draws 5 cards from the card supply as his starting hand. Place the wares as a supply next to the card supply. Place the gold as the bank next to the wares. Each player takes his starting capital of 20 gold (3 large 5 gold pieces and 5 small 1 gold pieces) from the bank, placing his gold in his play area. Place the 5 action markers in the middle of the table. The players choose a starting player, who begins the game. Note for the first game: Jambo lives on the clever play of valuable cards at the right, times. Players should use their first, games to learn the cards and how they can be used and save serious strategy play for later games. Each player owns a large market stand, on which he displays his wares. During the game, the players can acquire small market stands to enable them to show and sell more wares. 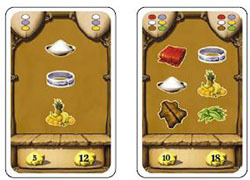 By playing ware cards, players can buy wares from the supply to place on their market stands. Similarly, players can use the ware cards to sell wares on their market stands to earn money on their investment. The price a player must pay to buy or receives when he sells is shown on the ware cards. 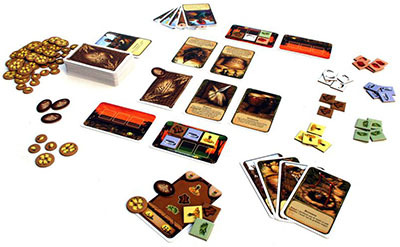 Players can play people and animal cards to help themselves or hinder their opponents. 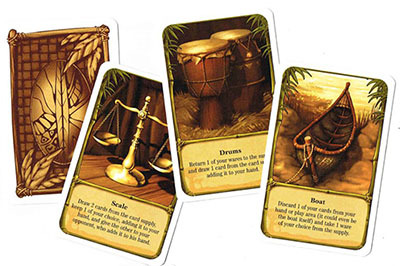 Players also can place utility cards in their play areas to give them special abilities during their turns. A player may use 5 action markers in his turn. For each action a player takes, his opponent counts it by taking 1 action marker from the middle of the table. After the player's turn, his opponent puts the markers back in the middle of the table. Important bonus: if a player has 2 or more action markers left (untaken by his opponent) at the end of his turn, he takes 1 gold from the bank. The player draws the top-most card from the card supply, looks at it secretly, and chooses to either add it to his hand or discard it face-up on the discard stack. This costs 1 action marker. If the player adds the card to his hand, he is done with phase 1 and moves immediately to phase 2. In phase 2, the player may draw no more cards from the card supply, except when using an action whose text allows it. If the player discards the card, he can draw another card or move to phase 2. Each card draw costs the player 1 action marker. In this way, the player may draw and look at up to 5 cards, but may only keep 1. Also, he may only choose to keep the last card he draws. Thus, for example, he cannot draw 3 cards and choose to take the first card he drew. It is possible for a player to spend all 5 actions markers drawing cards in phase 1. In this case, the player has no phase 2. The player may also choose to bypass phase 1, drawing no cards and go directly to phase 2. In this case, he can spend all 5 action markers on phase 2 actions. Note: in most, cases, players will spend 1 or 2 action markers drawing cards in phase 1, so they can add 1 card to their hands. Generally: Playing 1 Card Costs 1 Action! In addition to the large market stand that each player starts the game with, the players may build small market stands during the game by playing small market stand cards from their hands. They place the small market stands next to their large market stands and they remain there for the rest of the game. The small market stand has room for 3 wares. The first player who builds a small market stand pays 6 gold to the bank to build it. All further small market stands (for either player) cost the player building it only 3 gold, paid to the bank. A player may build several small market stands during the game. A player's small market stand limit is the 5 small market stands in the game. The ware cards are used for either buying or selling wares, and are discarded after use. Most ware cards show 3 wares, but a few show 6 wares. When buying, the player pays the bank the amount of gold shown on the lower left of the card, and takes all the wares shown on the card from the supply. He then places these wares on empty places on his market stands. If a player does not have enough empty places on his market stands for the wares shown on the ware card, he may not play it. If a player does not have enough gold to pay for the wares, he may not play it. A player may also not play a ware card if all the wares shown on the card are not available in the supply. He must always buy all the wares shown on the ware card he plays! The large market stands have space for 6 wares. The players pay nothing to use five of these spaces. However, when a player fills a sixth space with a ware, he must pay 2 gold to the bank. He pays this anytime he fills a sixth space on his large market stand, regardless of which space on the market stand it is. Note: most, of the time it. is advantageous to build a small market, stand. In this way you can avoid the cost of using the 6t.h space on your large market, stand and offer more wares for sale. When selling, the player takes from the bank the amount of gold shown on the lower right of the card, and places the wares shown on the card back in the supply. A player may not play a ware card to sell wares unless he has all the wares shown on the card on his market stands. player's play area. When a player has a utility card in his play area, he may use the function of the card anytime during his turns, even on the turn when he plays the card. A player may use each of his utility cards only once per turn. When a player uses a utility card, he turns it up- side-down to show it has been used. A player may never have more than 3 utility cards in his play area. If a player wants to play a 4th utility card, he must first discard one of the utility cards in his play area. He may even discard a card he has already used in this turn. A player may have more than one of the same utility card in his play area, which will give him the ability to use that function more than once (but, just once per card) in a turn. At the end of his turn, the player turns his used utility cards back, so they available for his next turn. Important: each use of a utility card costs the player 1 action marker! When a player plays a people card, he executes the action described in the text on the card and discards the card. reaction to the animal card. The playing of a guard card costs no action markers and negates the action of the animal card for both players. The guard card and the animal card are then discarded. When a player has 60 or more gold at the end of his turn, the game is nearly over. His opponent takes one last turn (5 action markers). After that, if the opponent has the same amount or more gold than the player who triggered the end of the game, he is the winner. Otherwise, the player who triggered the end of the game is the winner. Do not forget: if a player has 2 or more action markers left (unused) at the end of his turn, he takes 1 gold from the bank! The players can have as many cards in their hands as they want. 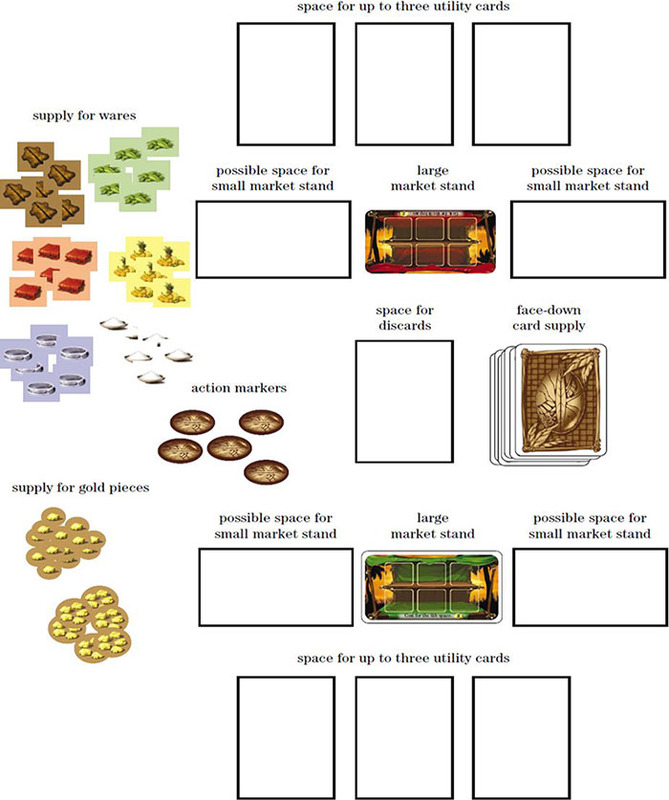 If a player does not have enough room on his market stands for wares he receives as a result of the effects of people and animal cards, he can choose which to take and which to leave in the supply. The players' gold is open to each other. If a player has no gold and wants to take an action that costs gold, he may not take the action. In order to better differentiate the utility cards from the person and animals cards, the utility cards have a different border and a darker background for the text field. If the card supply is exhausted, shuffle the discard stack and place it face-down as the new card supply.